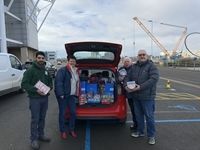 Middlesbrough Supporters Forum is asking generous Boro fans to take a donation for the Middlesbrough Foodbank to the home game against QPR on Saturday 23rd Feb 2019. With the support of Middlesbrough Football Club, the Forum has once again arranged a donation point close to the North Stand turnstiles for dry and non-perishable foods, or cash donations which are gratefully received, to support the invaluable work the foodbank does in the town. Middlesbrough Foodbank is part of a nationwide network of foodbanks, supported by the Trussell Trust, working to combat poverty and hunger across the UK. It provides three days’ of nutritionally balanced emergency food to local people who are referred in crisis. Anyone not attending the game can leave a donation at The Fork in the Road restaurant on Linthorpe Road, Middlesbrough. Media are asked to publicise in advance and are welcome to visit the donation point for photo/interview opportunities on the day of the collection. Are You A Potential FansOnline Site Manager? If you would like to run a site for a team not already featured on FansOnline, please get in touch and we will be happy to create the site for you. Showcase your products and services to our members at some of the best rates in the industry. With various advertising opportunities and placements why not get in touch to discuss your requirements today? Click here to contact us to discuss your advertising needs.